Want to learn how to play the guitar? Or to cook a new recipe? Or finally fix that problem you’ve been having with your computer? 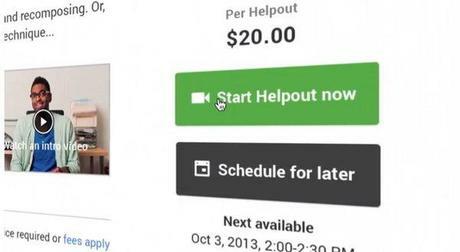 Google Helpouts is now at your disposal. This new service launched by the search giant enables everyone to learn to do things instantly, from anywhere in the world. 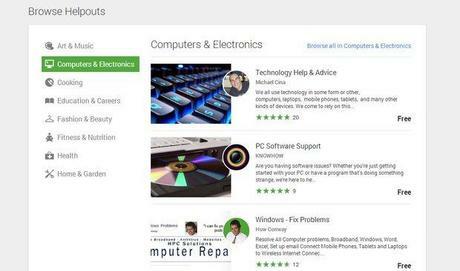 Google Helpouts is a place where you can learn to do things by getting lessons, opinions and help from experts. Currently there are thousands of helpers available to give advice through eight different categories, including Home & Garden, Computers & Electronics, Health & Counseling, Nutrition & Fitness, Fashion & Beauty, Art & Music, Cooking, and Education. You can get in touch with them instantly or schedule a time to get into a Hangout and learn later. The service can be accessed from the web or via the Android app. Most of the support topics are free. However, subjects like learning English, Nutritional Counseling or Guitar lessons could set you back a few bucks depending on lesson and the amount of time it takes. But, the money won’t go to waste because Google also offers 100% money back guarantee. Schools don’t teach everything and most of the time we have to learn other important things like cooking or coding by ourselves. Instead of reading a book, it’s always better to chat with an expert in real time and get advice on the learning. And that’s how Google Helpouts make self-learning easier than ever.